The award winning building was designed by architect Marc Levinson & team at Murthy Philips, the center was opened in late Oct 2014 by Baroness Martha Lane Fox. Nature formed the background theme for the 4 murals depicting a narrative based on The REMEO ethos which is Latin for “Return Home”. Meaning that patients come to recover and will return home. 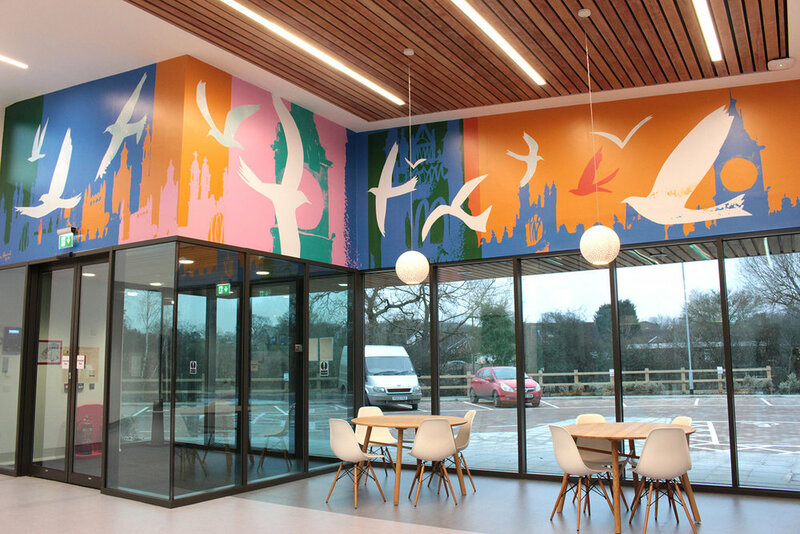 The artwork took five months to complete and a week to install, was on time and in budget. The story Return Home starts in the foyer with birds sweeping in above the glass windows. Westminster is shown in the background, which is where patients receive their initial treatment at St Thomas’ Hospital. There is one red bird, less robust than the rest of the flock. In the Social Area, the birds are in a garden setting. The two founders, Dr Geoffrey Spencer and Bjorn Ibsen, are taking tea. The red bird is resting at the birdbath while a stalking cat approaches. I wanted a guardian figure to watch over the bird and found a solution when I visited the Lane Fox Unit at St Thomas’s to draw the Houses of Parliament. In the small courtyard garden, I noticed a bronze sculpture of a young boy cradling a rabbit. The Boy is modeled on Dr Geoffrey Spencer’s son and provides another link between the two buildings. 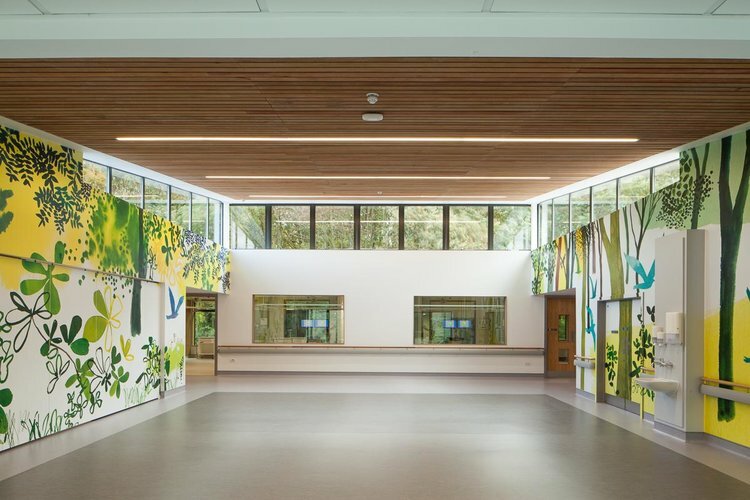 Moving on to the Central Ward, where two walls face each other, is a peaceful forest setting with 25 trees to celebrate the 25 years since the Lane Fox unit opened. This space is used for physio therapy treatment and many of the rooms look on to it. As the red bird becomes stronger, his colour changes to blue. On the opposite wall he has caught up with the flock and joined them, and, as a result, they all change. The flock is complete, and, renewed they head off into the forest and home.